FIRST OF A FOUR-PART SERIES OF PANEL DISCUSSIONS LEAD BY AMERICA”S VEGAN TRAINER, WILL TUCKER. This is the first in a four-part series to encourage more people to go vegan in 2019. The premise is to conduct in depth discussions that address some of the most common deterrents which make people reluctant to the vegan lifestyle while educating on the benefits. Each panel style conversation will feature a moderator with local experts from a variety of backgrounds discussing their own journey to becoming vegan while answering audience member questions and concerns. Robert grew up on a farm in Corvallis, Oregon, where he adopted a vegan lifestyle in 1995 at age 15. Today he is the best-selling author of the books, Vegan Bodybuilding & Fitness, Shred It! And the new release, Plant-Based Muscle. 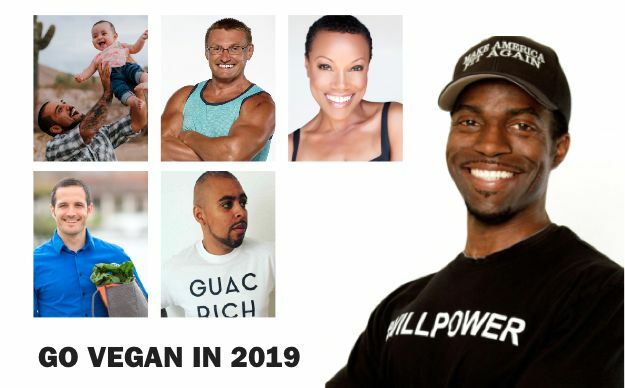 As a two-time natural bodybuilding champion, Robert is considered one of VegNewsmagazine’s Most Influential Vegan Athletes. He tours aroud the world, sharing his story of transformation from a skinny farm kid to champion vegan bodybuilder. Robert is the founder and president of Vegan Bodybuilding & Fitness. He writes books, gives lectures and maintains the popular website, www.VeganBodybuilding.com. He is a regular contributor to Vegan Health & Fitness Magazine, Naked Food Magazine,Forks Over Knivesand The Dr. T. Colin Campbell For Nutrition Studies, is a multi-sport athlete, entrepreneur and has followed a plant-based diet for more than 20-years. Dr. Benjamin Benulis is a plant-based physician in Phoenix Arizona. After recovering from a debilitating autoimmune disease years ago on a plant-based diet, he now helps others do the same.